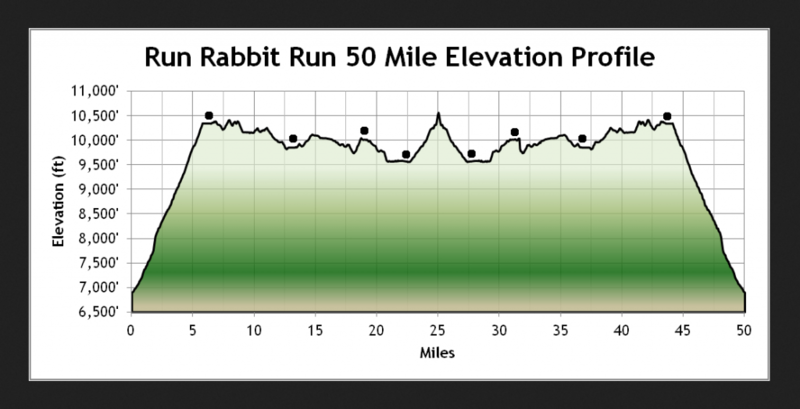 I knew that something was going to be different about Run Rabbit Run. The easy feel and good nature of all the communication around the race tipped me off. This seemed to fit well with how I was feeling about running these days. After the Tor de Geants (200+ miles) last year, I wanted a break from serious training. I didn’t want to be packed in with a thousand other runners, trying to shoulder my way through the crush of the start, avoiding getting poked in the eye by someone’s poles. The race organizers took the race seriously, but not themselves, which I appreciated. I also appreciated that the profits from the race were going to local charities, which is how it should be. Sakyong Mipham wrote in his book Running with the Mind of Meditation that « runners intuitively know that through dedication and hard work, success can come about: if we, as humanity, dedicate ourselves to creating a better world, then it is completely doable. 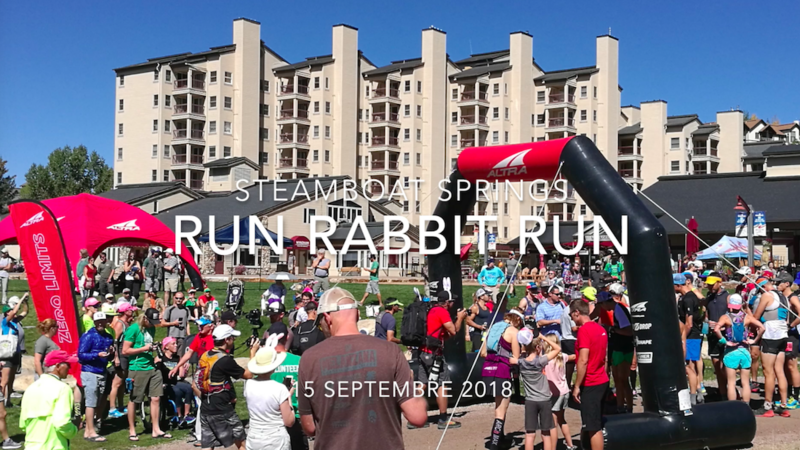 » Run Rabbit Run is a rabbit hole of positive energy for the better common good of Western Colorado and fir the runners who participate. The race route had to be reorganized at the very last minute due to forest fires in the area, and the organizers were total pros. They reorganized and rerouted over half of the course. And they never compromised the safety of runners: Don’t get eaten by bears. Don’t walk into wild fires. Check! 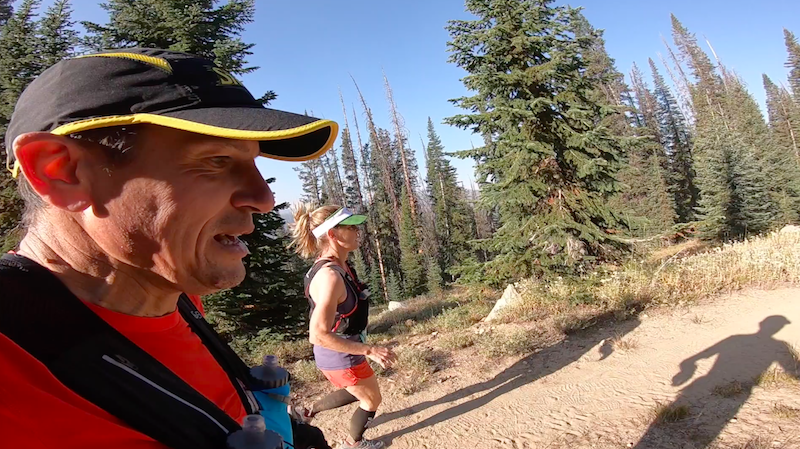 My good feelings about this race deepened when we found ourselves in the forest of the Colorado mountains. Yellow, green, pink, orange and gold. Moose, elk, eagles and chipmunks. And the people. The people were even more inspiring than the scenery. I forgot how friendly Americans could be. It’s not that people from other countries are not nice, of course, they are! But the friendly, outgoing, good-naturedness of Americans is something unique. Now, I am not saying that we all get along and everything is rainbows and flowers, but I just forgot how people say hi and strike up a conversation, even though they just met you. The lady who rented us a car, for instance. She gave us a big upgrade for free, because she didn’t like to think of us struggling to drive up the mountain in a small economy-size car. She also said she was excited to meet people from Madagascar for the first time and admitted to us that she studied a map of the world while she sat on her toilet at home! 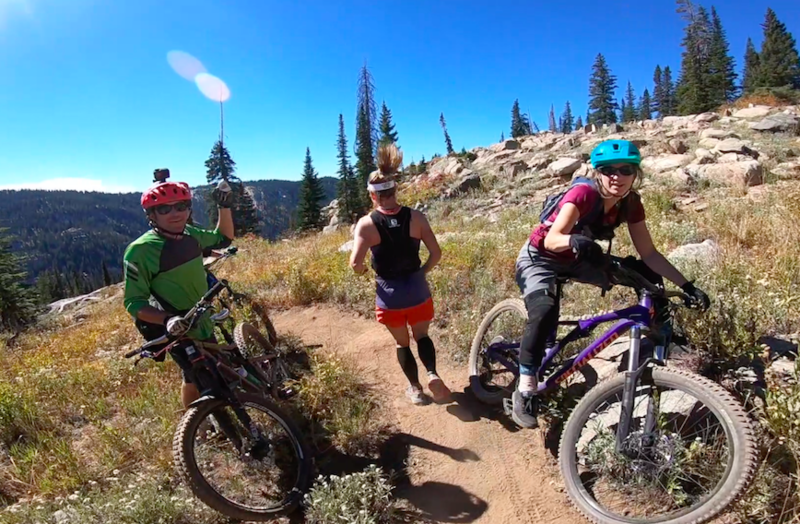 We did a little reconnaissance of the trails on our first morning in Steamboat. In fact, we were so excited to be in these superb surroundings that we over did it a bit the week before the race. We went out for 3 hours, 1 hour and again 3 hours in the days before the race. It was only afterwards that we realized how tired our legs felt! It was really cold the first morning, but then we met Charles. He warmed the air with a bighearted hello and some chit chat about the race. He almost made me forget about the tightness that I still felt in my calves. Almost. We crossed paths with him again later in the day at Twisted Trails running store, and he was still so charming and welcoming. At Twisted Trails, we were also welcomed by Kris, who was working that day. She helped me find a t-shirt, since I forgot to bring one (! ). But more than that, she talked to us like we were old friends already. It made me realize that I really miss having girlfriends to run with. 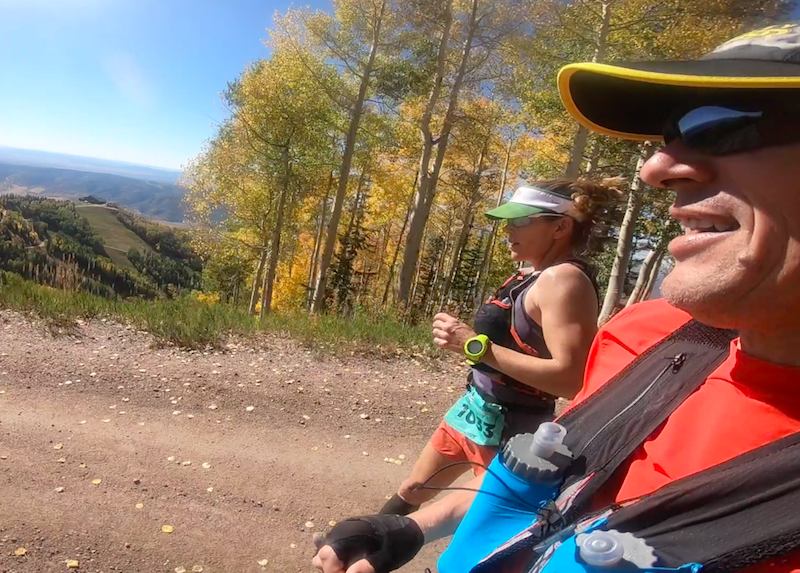 I love running with Eric and wouldn’t change my running partner for the world…but it would be nice to chat and run with other women sometimes. I wanted to take Kris home with me to Madagascar! And so there we were in this magical green and gold environment, treated like old friends and feeling the heaviness in our legs fade a bit. Good thing, because 50 miles (80km) is sill 50 miles! Race day: Thanks to the jet lag, I was up at 3:30 in the morning. Enough time to eat, have some coffee and do everything that you need to do before you run all day (toilet time ). I was so happy that my brother, Scott, and sister, Adrienne, got up early to see us off. In keeping with the casual way of things, the organizers called everyone to the starting line a couple of minutes before 6am. No music, no lights, no microphone. Just 5, 4, 3, 2, 1 and we were off for the first 6.4 miles uphill to the Mt Werner station. The sun rose quickly, so after 30 minutes we turned our headlamps off. There was even a guy on the road half way up the climb that took our lamps and jackets, so that we wouldn’t have to carry them with us the rest of the way. Cool! We took it easy, jogging and chatting with other runners. I guess we hiked pretty well, but after Mt Werner aid station, boy, did those girls fly! I had to keep myself calm. “My place is my place”. That’s what I say to keep from trying to follow other runners when I shouldn’t. And going out slow is ALWAYS a good strategy. About ten runners passed us between Mt Werner and Long Lake, all of them with an encouraging ‘good job’ before they took off ahead of us. 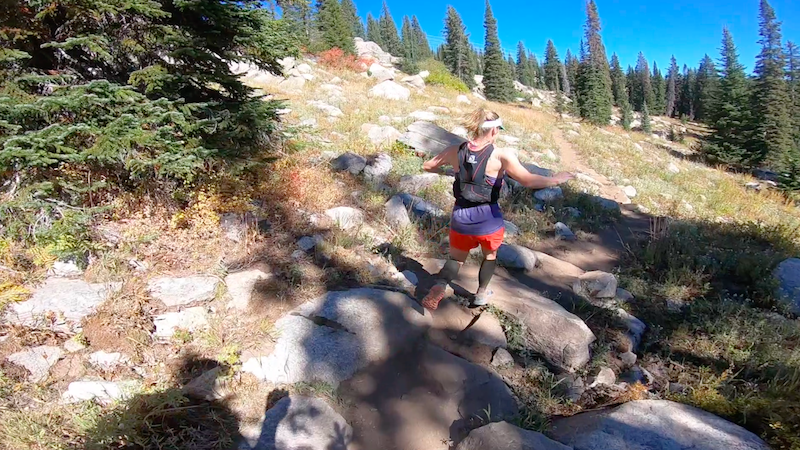 And so, we jogged easily to through next two aid stations, Long Lake and Summit Lake. The sun was shining but the breeze was cool. The volunteers were so cheerful and ready to help. I loved them! The food was amazing, too. So different from what we usually see. Instead of biscuits, crackers and dry fruit, we had pancakes, bacon, breakfast burritos, potato chips and peanut butter & jelly sandwiches. Wow! I was in heaven. The road between Summit Lake and Billy’s Rabbit Hole was, well, boring and long. But I know that it’s not what the organizers intended, either. If I had to choose between running on the road and running into a wildfire, I would choose the road too. 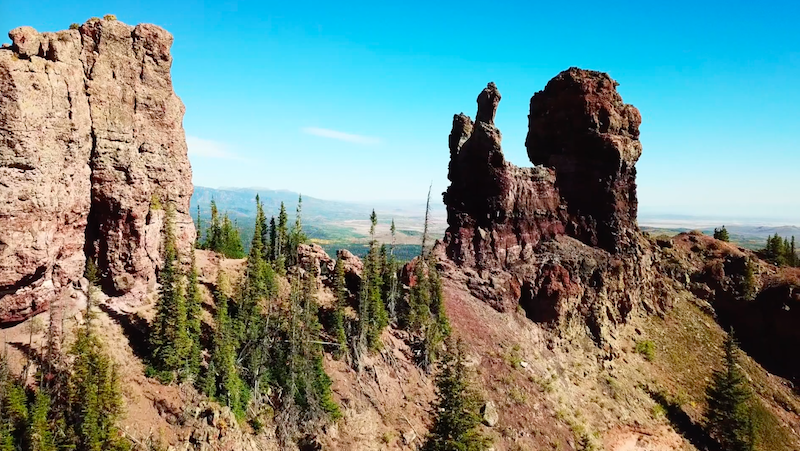 We were lucky to have climbed up to Rabbit Ears a couple of days before the race, so we had already experienced that breathtaking landscape. I had a piece of juicy watermelon, a handful of chips and the super kids helping at the station gave me some ice that I immediately put in my bra. Nice and cool! Thanks kids! The next part back up to Summit Lake was a bit more technical, rockier, but still runnable. We started passing the 100 milers and some nice folks on bikes cheered us on. It was gorgeous terrain with a panoramic view of the mountains around us. My stomach was starting to turn at this point, and I was worried that this was the beginning of the end of my energy. I took a gel, but it didn’t sit well. 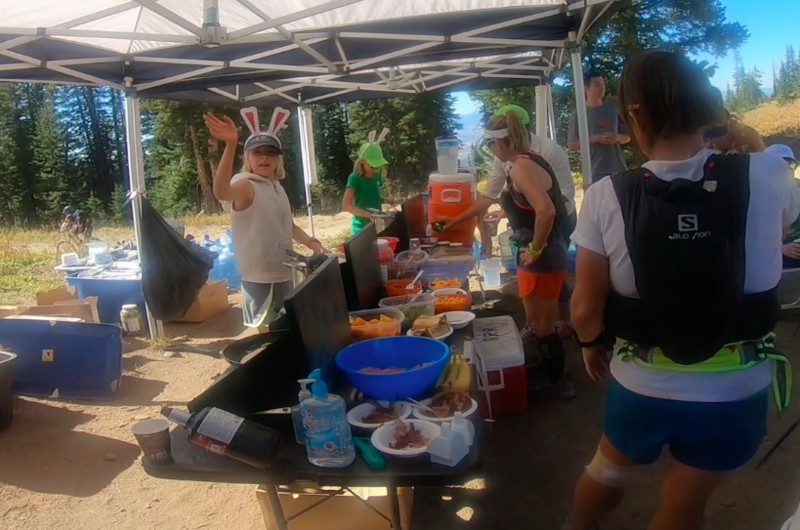 Once back at the Summit Lake aid station, I chewed on a Tums before we headed back into the forest and the long (8.4 miles) return to Long Lake. This section was a little exposed, and the sun was getting hot, but most was under cover in the forest. We were able to pick up the pace a bit, at least for the first two-thirds of this part. 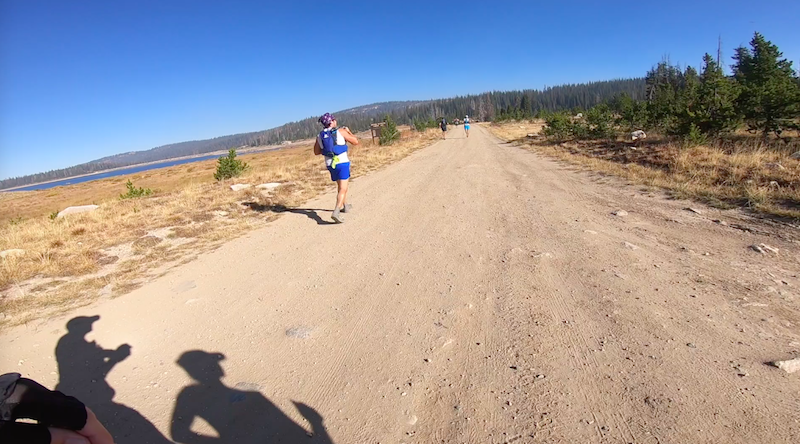 We caught up to the six or seven runners that had passed us on the road section and Flash of Gold sections. Honestly, we weren’t trying to catch anyone. I was just putting one foot in front of the other, concentrating on my breathing, trying to run tall and keep a regular pace. But I find that if I can keep that up, things usually go pretty well. Still, it was long back to Long Lake, and I was kind of dragging on the last uphill bit. At the aid station, a volunteer poured some ice water over my head before we left and this woke me up for a bit. And not too far out of Long Lake and who should come up behind us, but Stephanie, a super nice runner that we chatted with on the climb up to Mt Werner at the start. The poor thing had followed the course markings to Base Camp (the section of the course closed due to the fire), instead of turning right toward Long Lake. It was an easy mistake to make since the blue markers leading to Base Camp were not all taken down. I could tell she was disappointed, but she was still running well and quickly overtook us. We weren’t too far behind her coming into Mt Werner. But I was suffering from a bad case of low battery here. Eric clearly was ready to race down the last 6.4 miles to the Finish line, but it was hard for me to move faster than a shuffle jog for the first mile or so. I didn’t eat at Mt Werner, thinking that it would be an easy downhilll to the finish, and now I was paying the price. So, I swallowed half a gel, which almost came back up. I don’t know if it was the gel or just the idea of the gel, back I started running again. My quadriceps were crying, but I was able to pick up the pace. And we were moving downhill faster than either of us expected. Everyone we passed, 100 milers, hikers were encouraging. I can still hear them: “You’re killing it! Great job! Almost there!” So nice. We even caught up to Stephanie about half way down the hill. I could tell that Eric wanted to make a move, but I didn’t. We had a good run. She was running well. And I wasn’t even sure if we sprinted that I could maintain it to the end. So, we hung back and talked and enjoyed the last minutes of the race. 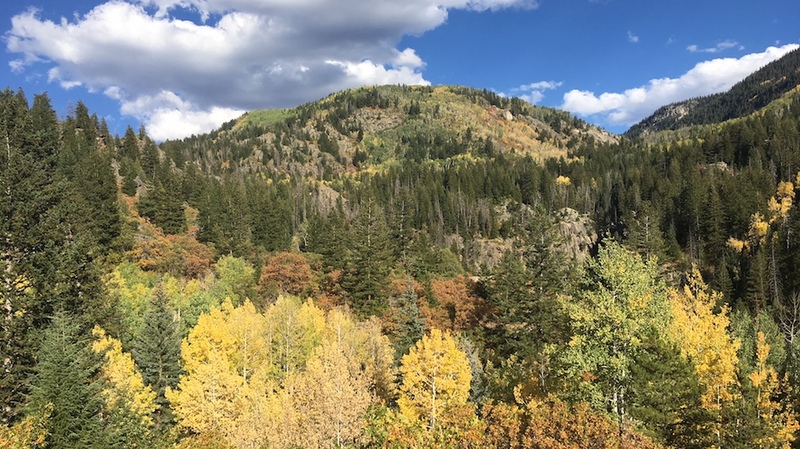 The aspen leaves glowed and glittered like gold coins in the afternoon sun, the views of the green mountains and the solidarity with the other runners on the road were too good to let go. 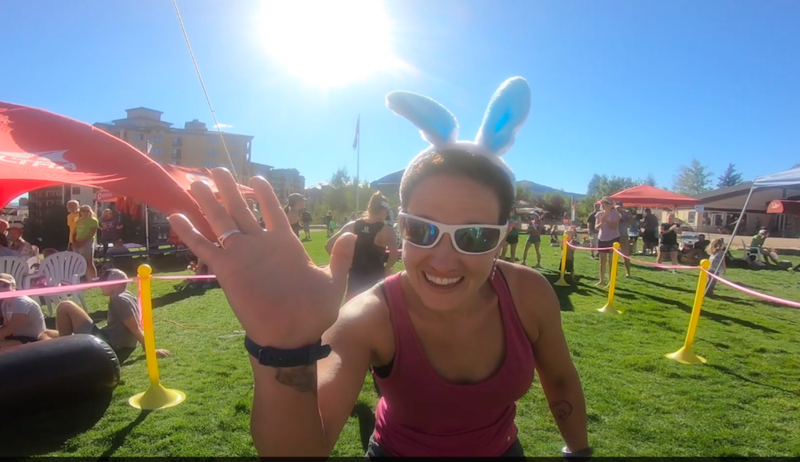 And there she was at the finish line, as promised, our bunny with our finish line hug! A high five from a little boy. The cheers of my family. What a great finish to a great day!